Annual income limits to participate are $129,000 or less for individuals and $191,000 or less for couples. The initial investment requirement is a minimum of $25. Ongoing contributions have a minimum deposit amount of $5. Not tied to any particular employer; goes with participant when changing jobs. The government guarantees the account balance will never go down. Earnings are tax free, similar to a Roth IRA. Employers won’t administer the program or incur any costs to offer myRAs. A myRA can roll over into a Roth IRA at any time. Earnings can be withdrawn tax free after five years if the participant has reached age 59 ½. They don’t give savers multiple choices about how to invest their savings. The guaranteed account balance comes at the expense of growth. The interest rate of 3% will take about 24 years to double your money. The maximum amount saved is limited to $15,000 or 30 years whichever comes first. Low income savers who live from paycheck to paycheck will have very little incentive or ability to participate. Those who do participate may be inclined to borrow from the myRA the first time the car breaks down or an unplanned expense arises. $15,000 is not enough for retirement. Participants must have direct deposit of paychecks. Contribution can be withdrawn at any time without a penalty, but if made before age 59 ½, tax must be paid on the interest accrued in the account. Purported to be a new retirement savings plan, the myRA reminds me more of “Banking Days” when I was in the third grade. Every Thursday morning the teacher would poll the class to see if anyone wanted to make a deposit in their savings account. As I recall, I never had more than ten or fifteen dollars in the account at any one time. I always managed to find something that I just couldn’t live without, so I would make a withdrawal from the account to fund the purchase. I expect that this will also be the fate of many myRA participants. John E. Girourd, author of Take Back Your Money, thinks there may be an even more compelling reason for the government’s participation in the program than helping poor taxpayers save for retirement. 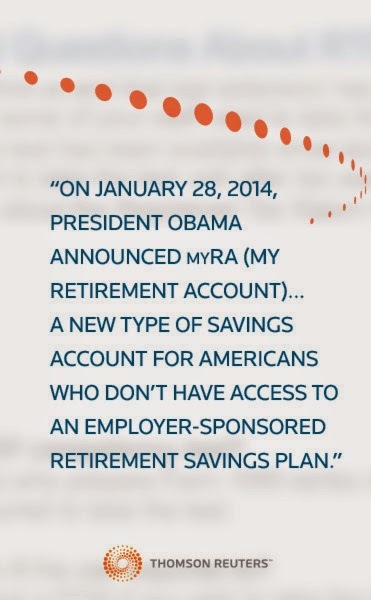 The government touts myRA as a program providing individuals with a simple, safe, and affordable way to start saving for retirement. However, without a significant deterrent to discourage savers from withdrawing money from their myRA, the financial demands on low- and middle-income savers will override their desire to save for retirement.